Minister Bennett addresses memorial vigil held for the 11 victims of the shooting attack in Pittsburgh. 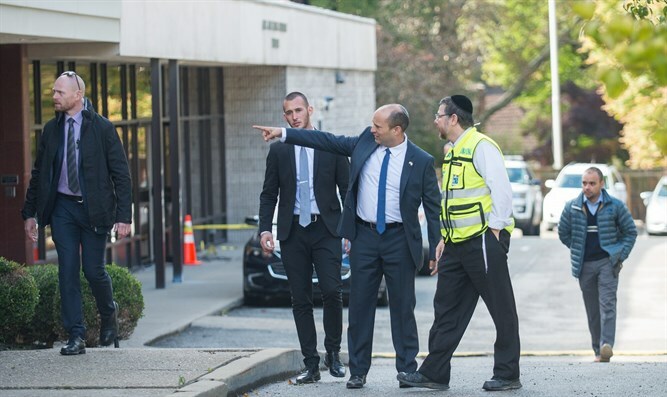 Minister of Jews in the Diaspora and Minister of Education Naftali Bennett on Sunday evening addressed a memorial vigil held in the city of Pittsburgh, for the 11 members of the Jewish community murdered in the shooting attack at the Etz Chaim Congregation on Saturday. Minister Bennett was visiting the city as an official emissary of the Government of Israel, to offer strength and support to the Jewish community following the terrible tragedy. The Minister met during the day with leaders of the Pittsburgh Jewish community, and wider American Jewry, as well as with Governor of Pennsylvania Tom Wolfe, and Pittsburgh Mayor Bill Peduto, as well as Members of Congress representing the state. In an emotional meeting, Minister Bennett sat with Rabbi Jeffrey Myers, the leader of the Tree of Life congregation which was attacked, who managed to help usher some of his congregants to safety. The Minister then went on to visit the site of the attack, and met with ZAKA and other emergency crews, who had helped the local Police, who he also thanked for their great bravery. Addressing the vigil, an event with more than 4,000 attendees from across the Jewish and non-Jewish communities in the city, including the Governor and Mayor, Senators, Congressmen, as well as President Trump’s Special Envoy Jason Greenblatt, Israeli Ambassador Ron Dermer, and New York Israel Consulate General Dani Dayan. He told the thousands at the event that he came to offer the support and condolences of all the Israeli people.